Previously, on MinerBumping... When Avengers Of Death corp anchored an unlicensed engineering complex in New Order territory, Agent Arden Elenduil carried out an investigation of the corporation. He was appalled by the level of bot-aspirancy he witnessed. Arden demanded that CEO Legend Bramotieen pay him 500 million isk. In response, Legend and his lackey, Strife DarkStar, launched a cowardly attack against Arden--only to be defeated by the Code. 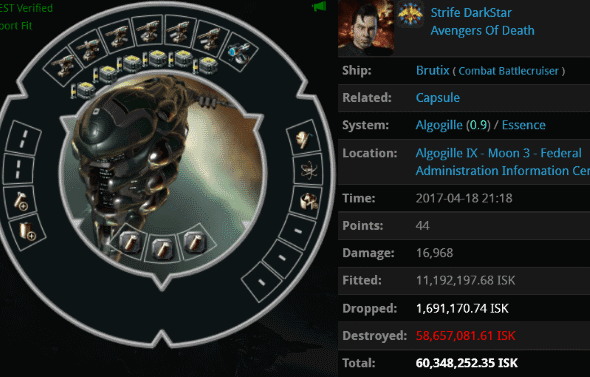 Legend and Strife lost 200 million isk worth of ships during their failed attack, and Arden's spy alt liberated 300 million isk more. Arden had therefore already extracted 500 million isk from the corp. But to get credit, a carebear must hand over his isk voluntarily. Avengers of Death attracted the attention of other highsec wardeccers. This gave Arden a golden opportunity to review the Avengers' killboard and gain additional intel. For example, Strife's Brutix was killed by a member of I Know Right alliance. Arden was able to study the fit to find vulnerabilities. During Arden's conversation with Legend--the one punctuated by the Legend's treachery--the carebear had whined about being an impoverished newbie. The killboards told a different story. Legend lost not one but two Navy Megathrons to the other wardeccers. The penniless "newbro" was burning money at an impressive rate. Arden's wardec went live, and he sent to work hunting down the Code violators. By now, they were beginning to fly cheaper ships. Still, Arden knew Legend was lying when he said he didn't have 500 million isk to pay. All this time, Arden's spy alt was keeping a close watch on the corporation. As usual, the clueless carebear CEO held himself out as an expert who knew all about the game. As he tried to impress the new players in his corp with his knowledge, he gave them all terrible advice. And Legend didn't mind losing isk; apparently he had a PLEX habit. Of course, the CEO didn't give a single thought to his fellow corp members, who were being incinerated by wardeccers. Friar Johnson > Vindicator this a good choice for a ship? Recent Avengers recruit Friar Johnson asked the wise Legend Bramotieen what he thought about Vindicators. 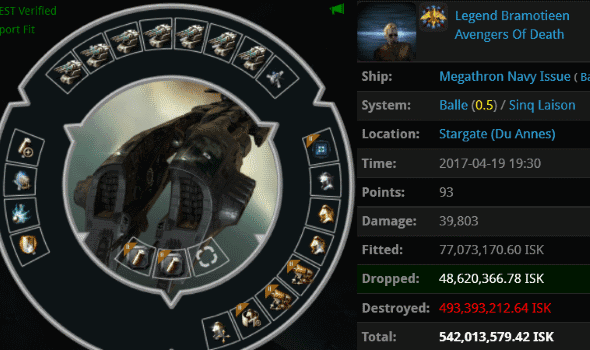 Legend loved to lose Navy Megas, so seeing the ship info for a Vindicator made him salivate. 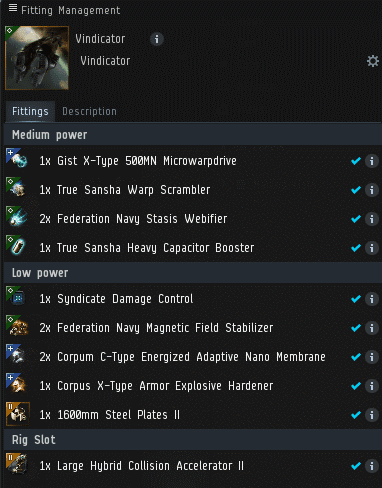 Within minutes, Legend suddenly found isk to splurge on a Vindicator. Friar Johnson > skill injector? Naturally, Legend saw no reason not to throw away some money on Skill Injectors, too. This was the man who refused to pay 500 million isk to protect his newbie corpmates. Arden's spy and another alt offered Legend a link to a special fit for the Vindicator--a blingy, decadent fit. Legend couldn't resist. Practically drooling, he purchased all of the modules on the list. The fit had a fatal flaw, though: the total absence of any weapons. No matter. Legend eventually noticed this innocent mistake, so he purchased some guns for the Vindicator. Arden's alts somehow managed to convince Legend to lend them the newly-built bling boat. Legend then realized that he'd been had. Arden gained over a billion isk from this ruse, but his spy was burned. Retribution was coming. Wonderful stuff. This story is getting better and better. The CEO has plenty of ISK but he's letting his corp be eviscerated. This so-called CEO should not be allowed near EVE, let alone run a corporation. Man, some agents come up with scams that would never had even occured to me... BRAVO! How can AG even compete with this? I'm so glad I'm in rehab. I like Legends's outburst "Friar you betrayed us". Where did the 'us' come from? So far, everything of any isk value seems to belong to the decadent CEO, who has been betraying his own corp members left right and centre. The story is very funny, of course - yes, I burst out laughing too! But there's a serious side to all this, a disgusting and serious side. We're often accused of 'killing newbs', as if upfront spaceship combat is somehow 'not nice' in a full-on spaceship combat game; however, in-your-face misleading and robbing them is a whole other thing. CEO Legend (still makes me smile) deserves everything he gets. Masterfully orchestrated by one Arden Elenduil. Hats off, ladies and gents! The reddit/ag/provi carebear crowd likes to cry about new players getting turned off EVE by gankers/pirates/wardeccers. As rational people know, the latter are groups who have learned to win at EVE using valid mechanics to the fullest, and the former are merely using newbies as a shield to further their own selfish interests. A real problem, and one that doesn't get much attention, is the despot CEO of a newbie's first corp. The CEO is the person who gets to know a newbie on a personal basis while the newbie is still gullible and impressionable, and then has the gall to exploit and misguide him. My hat is so far off it would take NASA 100,000 years to reach it. Sterling work by Agent Elenduil. Step 1: Admit that we as anti-gankers are powerless to stop the Code. That our Eve lives have become boring and without Code we would have no content. Remember, recovering Anti-Gankers: One day at a time. Well, at least the 2nd MNI didn't have any civilian modules in the fit. Maybe he's slowly learning! You couldn't make this stuff up even if you were a Hollywood writer. 301dps that's 2500 damage a second. An unlicensed EC? How does that even work? Does code really go after them? Sure, why not? Highsec is James 315 Territory after all. If a corp has a non-compliant CEO, then it's a non-compliant corp. Non-compliant corps are not entitled to property. Get your permits today, folks! People like Legend make me worry for our future. I hope someone rescued his newbros before he did too much damage. I wonder whatever happened to Veers, he could have shown these carebears the proper way to cry. There's no lack of salt mines, even with Veers gone.